Whilst the complexities of physics, chemistry and biology may have left a number of grownups more than a little confused and a little jaded with the subject, science is still an extremely important tool for learning. Educational professionals have stated that science literacy is imperative in improving our society. In a world where crime rates are increasing and the effectiveness of the economy is decreasing, it is important to equip today’s youth with the knowledge and skills that are necessary for the future. By purchasing science games for kids, you are doing just that. If you are interested in equipping your child with an in depth understanding of the world and how it works, it is important that you start with science. 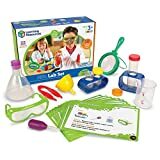 What could be better for encouraging your child to explore the world than their very own scientist kit? This bundle has everything you need to get started exploring the wonders of science together. Created by Fresh Development. Copyright 2019. All rights reserved.